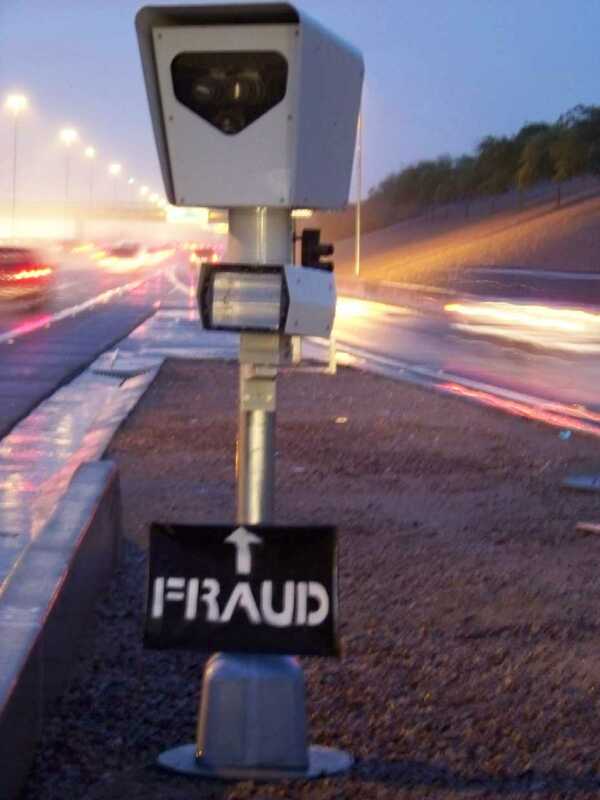 Late Thursday evening, authorities responded to a Redflex ‘automatic license plate recognition’ (ALPR) alert regarding a suspicious vehicle traveling northbound on a major Phoenix freeway. Information provided by Homeland Security’s Internal Compliance Squad (DHS-ICS) alerted ground units that a late-model Mazda was being driven by a watchlist suspect, believed to be CameraFRAUD co-founder Shaww Duel. When ICS Police attempted to stop the driver, officers claim the vehicle sped towards them and repeatedly rammed their new federally-funded “patrol & pursuit” Subarus. Sadly, one of the officer’s vehicles rolled over during the chase, but no injuries were reported. Blowing through camera zones at speeds exceeding 149 miles per hour, the suspect’s elusive driving poses a threat to the illusion of photo enforcement being effective at stopping traffic violations (even in video games). National Surveillance Association (NSA) was created in 2011 as an ambitious public-private partnership, providing sensitive personal information to the government on demand in real-time. Members include Redflex Group, American Traffic Solutions, NLETS, as well as all of your local, state, and federal law enforcement agencies. Internal Compliance Squad (ICS) is an elite internal paramilitary division of the Department of Homeland Security. Agents spend years screening passengers for non-existent threats at airports before being promoted to ICS. Want a challenge? ICS agents enjoy a “level two” starting salary of $26,400. Join the faSStest-growing industry in America! Search for openings at htp://www.jobs.gov. An American Traffic Solutions / City of Mesa “photo enforcement” vehicle was caught red handed early Saturday afternoon breaking various traffic laws. The incident occurred early Saturday afternoon on westbound US-60 in Mesa, Arizona near exit 181. A CameraFRAUD volunteer witnessed and recorded the incident. 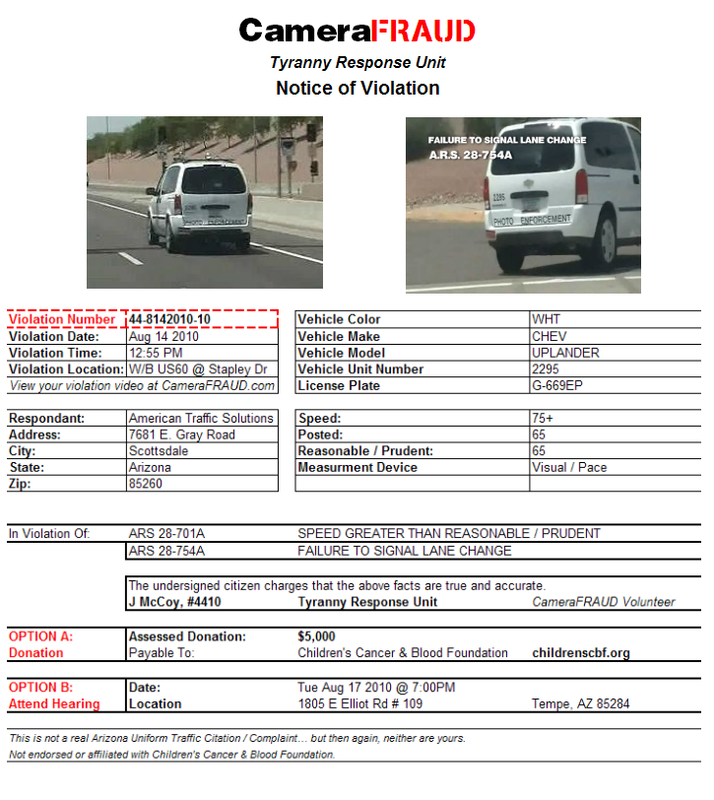 The white Chevrolet Uplander was observed exceeding the posted speed limit on the US-60 and failing to signal a right-hand turn onto north Stapley Dr.
CameraFRAUD has collected details about the “tali-van” scofflaw, and in a twist of roles, will issue a “Notice of Violation” to American Traffic Solutions on Monday. Much like the millions of notices the Scottsdale-based company issues each year, the violator will be given the option of paying an arbitrary “fine” or attending a hearing. An “Assessed Donation” in the amount of $5,000 made payable to the Children’s Cancer and Blood Foundation by American Traffic Solutions is requested by CameraFRAUD to cure the violation and the flagrant disregard for the law exhibited by the photo radar van driver. (Disclosure: We are not affiliated with CCBF, nor are they a sponsor or part of our request). Automated ticketing vendors have a long history of breaking various statutes and flaunting the law when it suites their needs. In September of 2008, a Redflex van driver was arrested for DUI while driving from Scottsdale to Tempe to set up the vehicle. 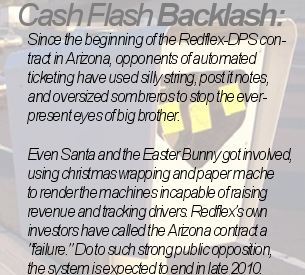 In September of 2009, another Redflex driver was caught on tape in north Phoenix driving recklessly in the fully-marked faux-DPS Ford Escape. In addition, numerous high-ranking executives of both ATS and Redflex have ignored their own tickets in a blatant example of do-as-we-say-not-as-we-do. ATS has never been shy invoking “the children” as a reason for the usage of automated ticketing. Now that they’ve been caught (again), it’s time for them to put their money where their mouth is and make a donation to a worthy, independent cause. We eagerly await a response from American Traffic Solutions and will keep you posted with what happens. The victim thought upon receipt of the “notice of violation” that the ticket was a scam (and rightfully so) and got the matter resolved only after involving the local media. 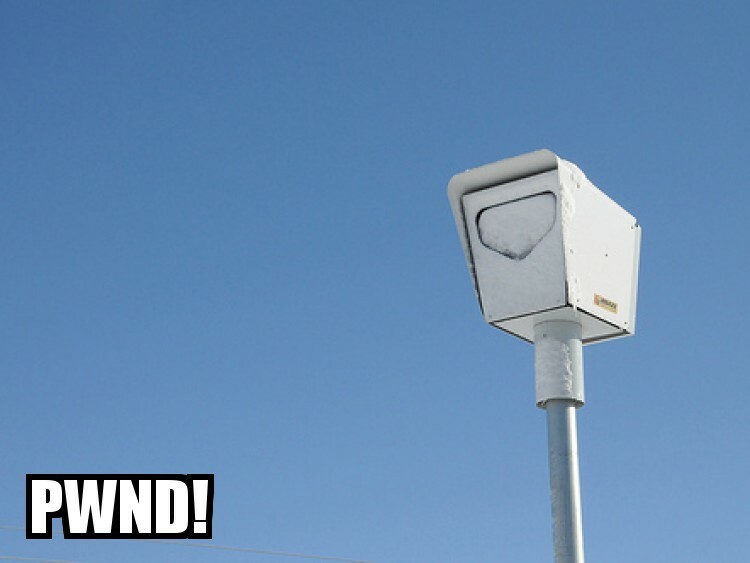 Officials will have to re-evaluate whether to pursue the use of red-light cameras now that… a new state law would take a big chunk of local ticket revenue. Here’s something to make Palm Coast officials see red: The company that runs its traffic light camera system is asking to more than double what it currently charges the city. A CITIZENS’ revolt against red light cameras in New Orleans has led to claims a Victorian company agreed to pay a share of the fines to a former city councillor if it won a contract. 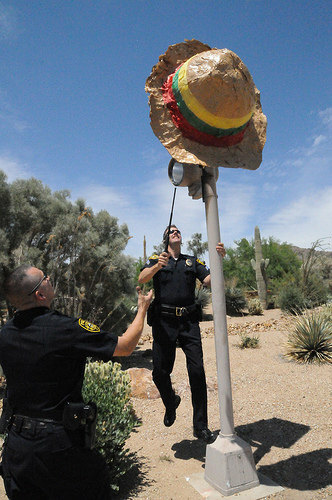 A giant sombrero placed over a Redflex ticketing machine in Paradise Valley, Arizona was stomped on and destroyed by town police officers before being placed in the back seat of a cruiser. CameraFRAUD volunteers had gathered at the “scamera” location in the upscale Phoenix suburb late last month to assist a production crew from Comedy Central’s “The Daily Show” in obtaining footage and interviews regarding two controversial Arizona policies: photo enforcement and SB1070. According to witnesses, PV Ofc. Steven Chavira arrived on the scene and immediately demanded the production crew cease filming, using his hands and body in an attempt to obstruct the crew’s cameras, apparently unaware of the irony of his actions. Did the officers act inappropriately? While covering or blocking a ticketing camera isn’t known to violate any local or state law, the officers actions appear to be unprofessional: the immigration debate is a hot topic; sworn law officers stomping on something racially symbolic is a public relations fiasco in the making. Furthermore, destruction of evidence is a serious crime, and would be applicable if the town had decided to attempt to maliciously pursue the individuals responsible for the placement of the sombrero.